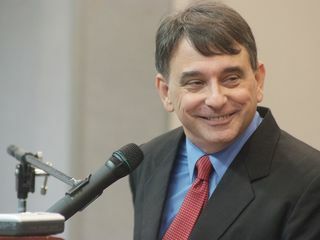 Taipei, July 3 (CNA) William Stanton, director of the Taipei office of the American Institute in Taiwan (AIT), is the third foreign diplomat who has chosen to remain in Taiwan after retirement. Stanton, 65, announced Tuesday that he plans to take up a teaching position at the Taipei American School in August after his official retirement from his current post in late July. AIT represents U.S. interests in Taiwan in the absence of official relations between the two countries. Over the past three years, he said, he has traveled to Pintung, Hualien and Matsu counties and met many friendly people along the way. Two other foreign representatives to Taiwan -- Henrik Bystrom and of Sweden and Menno Goedhart of Holland -- also chose to remain in the country after they retired from their diplomatic posts in 2010. Goedhart, who also goes by the Rukai tribal name "Daganau" because of his close friendship with the country's indigenous people, published last year a book about Taiwan’s scenic sites.